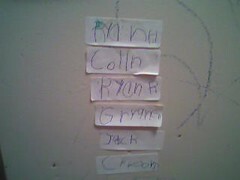 Ryan H, Colin, Ryan R, Gryphen (i think? ), Jack, and the last one I can’t make out…. He’s 6 and I think this is adorable writing! I’m so pleased. I want us to start writing hand-over-hand with Chris too and see what he can do.